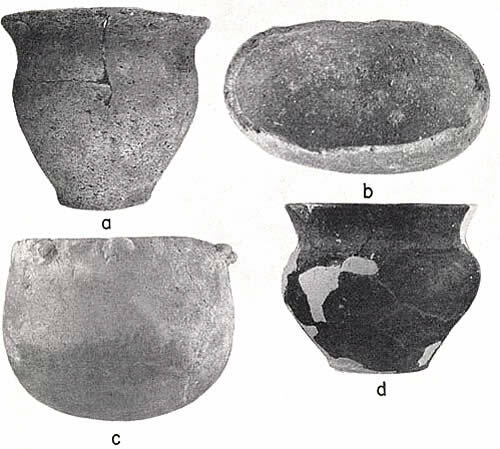 Once reconstructed, sherds of Nocona Plain pottery from the Harrell site might resemble these vessels found in graves in east-central Oklahoma and northeast Texas, according to Krieger. He suggested these vessels may have been trade ware brought into areas where this type of pottery was not locally manufactured. Vessels a and b were found in LeFlore County, Oklahoma. Vessel c was from a a site in Fannin County, Texas, and Vessel d from a Titus Focus burial in Titus County, Texas. (Photo from Krieger 1946).